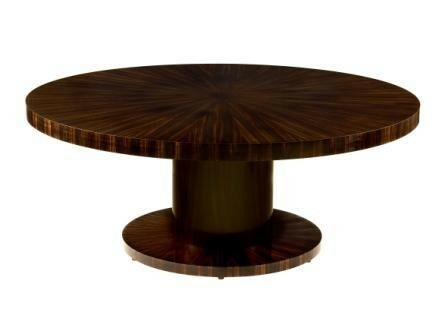 A fabulous Round Art Deco table is simple in style allowing the pattern matched Macassar to be the feature. Around 100 sections make up the sunburst top of veneered Macassar Ebony, giving the table a dramatic look. The table has then been aged in a finish that adds a warm patina. This table is timeless and works well in both Art Deco or contemporary settings. Seats 8-10 Called the "Alexander Table".